Is your bathroom decor less than impressive? Take control of your bathroom’s potential this year with our top seven decorating ideas. Trust us, you will not want to miss out on these! Let’s take a look. 1. Color Me Brand New. Like in any room, paint can completely transform a space. What was once boring and dull, can transform itself into a tranquil and relaxing oasis. And we are not just talking about the walls. You can repaint your cabinets and shelving units for a new stylish look. If your bathroom walls are looking a little bare, you can spice them up with wall art. You can even utilize your own photographs to make the space personalized to you. Just look for creative vacation photos or unique shots that can be used throughout your space. You may be surprised by how much your photographs can do for the space. 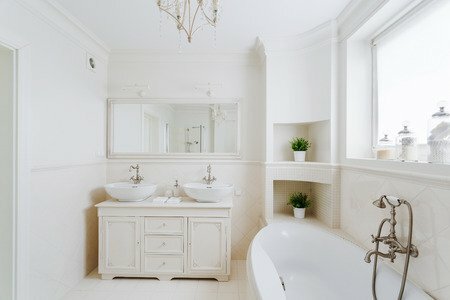 Lighting is a big topic for bathrooms. Not only does lighting help you get ready in the morning, but it also can set the tone for the space. At the end of a long day, we are sure that you do not want to be greeted by bright lights. Instead, you would probably prefer a dimming switch to set the tone whenever you want. A dimmer can be a great investment for homeowners wanting to set the ambiance whenever they desire. We would also recommend adding lighting above your vanity and inside of any built-in shelving. The built-in shelving lighting creates an elegant look and helps you to find whatever you need whereas the vanity lighting will help you get ready in the morning. From your backsplash to your floors, tile can make quite the statement. You can create a gorgeous layout inside of your shower and even add heated tile floors for when you step out of it. Tile can be as functional as it is stylish. Take some time to browse our online showroom at https://www.mybigbobs.com/tilecatalog#pageIndex=0. When deciding on decor for your bath, you will want to select pieces that provide optimal storage. Baskets and bins can be decorative pieces while providing a place to store your items. You can even line your builtins with baskets and bins to provide a stylish touch. Whether you are remodeling your current bathroom or buying a new home, it is never too late to invest in some new materials. Bath towels, rugs, and robes can all be upgraded for a more luxurious feel. Plus, the elegant look of your new materials will help add to the room’s overall decor. Finish off the space with delicate decor finishes like flowers, candles, and lotions. You will want to incorporate these types of items because they can be used for a purpose as well as decor. For example, the soft detail of a tea light candle can help set the tone for the space while providing a decorative touch. We hope you enjoyed these decorating ideas. If you are in the market for new floors or backsplash, please keep us in mind. We would love to help you create the bathroom paradise you have always dreamed of having. I do like that you mentioned that candles can set the tone of your bathroom while giving your space a better aesthetic appeal and decor. My husband and I wanted to do some changes to our bathroom to make its atmosphere more relaxing without compromising the way it looks. I will make sure to consider shopping for square dripless candle sets that I can use to decorate our bathroom. Thank you for your kind comment, Ellen! We definitely think that candles can help spruce up your bathroom aesthetic appeal and square, dripless candle sets are a perfect option. I love all your bathroom decor ideas. Especially how towels are in themselves a decor item. I am drooling over all the beautiful bathrooms you showed us. Loved this post! Thanks.